This year looks set to see bigger changes in how we use our credit cards than any before. Most of these are innovations resulting from new (at least to us) technologies. Some may be invisible yet important to users, while others may change for ever the ways in which we use our cards -- and the ways in which we benefit from them. This year, 600 million EMV chip cards are due to be issued in the U.S. That's more than four times as many as are currently in circulation, though fewer than the 900 million expected to be mailed out during 2016, according to the EMV Migration Forum and Smart Card Alliance. By now, most people know what these are: They look almost identical to existing plastic, but have a small on-board microprocessor chip, which makes them virtually impossible to clone. The process for using these is different from what we're used to. With EMV-enabled terminals, your card isn't swiped. 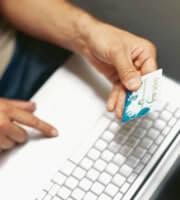 Instead you insert it in a slot, and leave it there during the transaction process. You'll be prompted by the terminal's display either to type in your four-digit personal identification number (PIN) or to sign on the screen, as you do when signing for a delivery on an electronic device. Finally, a message will appear confirming the transaction and asking you to retrieve your card. In most of the world, EMV appears in its chip-and-PIN flavor, because using a personal identification number has proved a much stronger defense against fraudulent use in other countries. However, for some reason, most American card issuers seem to be choosing to retain chip-and-signature authorizations, even though 47 percent of all the world's card fraud occurs in the U.S. Go figure. Don't panic if you don't receive a replacement chipped card until 2016 or even later. EMV terminals still have a swipe facility, and you can continue to use chipless ones as normal until they expire. You may not notice this second change happening, but it could be good for your blood pressure. Behind the scenes, payment networks, banks and credit unions, merchants, payment terminal manufacturers and law enforcement are all working together to try to reduce the incidence of successful hacks of credit card databases. Over time, information concerning hundreds of millions of cards has been exposed to criminals, including in high-profile cases, such as those of Target and Home Depot. IT security isn't a war anyone expects to win: Every time a hole is plugged, some spotty hacker or criminal mastermind in Beijing, Pyongyang, Moscow or Cleveland works twice as hard to find a new one. But it could be argued that there hasn't been as much of a focus on security as there should have been in this country, and initiatives reaching fruition in 2015 could see a decline in successful hacking events. The market largely remains a niche one for early adopters. That's partly because consumers are unconvinced by wallets' advantages, not least because too few retailers have those NFC-enabled POS terminals [point-of-sale terminals that permit payments by smartphones], and partly because retailers are unconvinced, not least because too few consumers have digital wallets. It's a vicious circle. Has Apple Pay broken that circle? It's too early to say for sure, but the number of card issuers clambering on board its bandwagon looks encouraging. Meanwhile eMarketer forecasts that American "proximity payments," those made in-store by smartphones, are set to top $27.5 billion in 2016 -- compared with just $1.6 billion in 2013. Small wonder then that Samsung is expected to launch its own wallet in 2015. Meanwhile, merchants are exploring new ways to build loyalty through smartphone-based co-promotions. For example, United Airlines recently unveiled MileagePlus X, an upgrade for users of its rewards credit cards who pay for purchases with mobile devices. They can earn additional rewards from selected partners, as well as redeem miles and manage their programs on their smartphone screens. This really could be the year in which mobile wallets reach a critical mass. At the same time, Apple's iBeacon technology continues to be refined. This allows smartphone users (only those who opt in) to be tracked, aisle-by-aisle, as they walk around a store. If you spend some time checking out, say, the refrigerator display, you may well receive a text other message offering you a discount on a particular model. Technology has been changing the ways in which we shop and use our plastic for some time. But 2015 could be a transformational year. 0 Responses to "How your credit cards are going to change in 2015"